GM Kirill Stupak, the 7th-seeded chess player is the winner in the 80th Belarusian Chess Championships. The 80th Belarusian Chess Championships were held from 7th to 19th January. At the event the men's event included 14-player round robin with the average 2456. GM Kirill Stupak presented a fantastic tournament in the Chess Championships this year. He took a clear first place with 9 points and finally earned the title of national champion. Belarusian Chess Championships was first held in the year 1921 and it had Solomon Rosenthal as its winner. Since then this enthralling chess championship is held every year and it witnesses wonderful match amongst top seeded players. The 65th Belarusian Chess Championship was held in the year 1999 from 18 to 28 February. 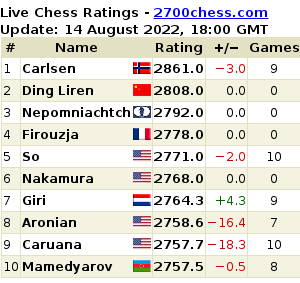 GM Viacheslav Dydyshko won the 12-player, single round-robin tournament (average Elo rating 2424). He earned his tenth championship in 26 attempts. Organized by FIDE Belarusian Chess Championship is a popular event that enables players from all parts of the world to showcase their talent. Additionally, this chess championship is a platform that highlights the natural champions.